Present state: The station has been demolished with farm buildings standing on the site. The weigh office is still extant within the farm yard. 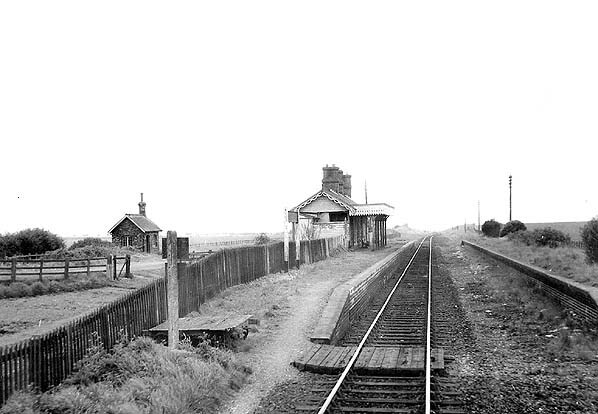 The stationmaster's house still stands adjacent to the bridge over the B1449..
Notes: Sutton on Sea had two platforms with a passing loop with a timber building comprising the booking office and waiting room on the down platform but no buildings on the up platform. The loop was only used during the summer when excursion trains to Mablethorpe used the line. A small single storey signalbox stood on the platform adjacent to the station building, this controlled access to the goods yard on the opposite side which comprised two sidings, one running into a timber goods shed. There was a water tower between the two sidings. The goods yard had cattle pens and 1 1 ton 10 cwt crane. The yard closed on 30th Match 1964 and the goods shed was quickly demolished and the sidings lifted..
A line to Mablethorpe was first proposed in 1864 running from the East Lincolnshire Railway at Alford via Beesby to Mablethorpe. An Act for the new line was obtained on the 29th July, 1864, but lack of local finance meant work couldn't start and powers eventually lapsed. In 1871, the Louth and East Coast Railway was formed to build a line from Louth to Mablethorpe with a branch from Saltfleetby to North Somercotes. The company received its Act on 18th July 1872 and the Great Northern Railway agreed to work the line for 50% of the receipts, providing staff and 4 trains a day for twenty one years. In October 1873 a proposal to build the original route between Mablethorpe and Alford was resurrected but despite local support, a Bill was rejected by Parliament because Mablethorpe would be adequately served by the L & ECR where construction would soon be underway. Contractor Henry Jackson was appointed to build the line and work started in September 1875 with the optimistic intention of opening in the summer of 1876. Progress was however slow and by July 1876 rails were only laid as far as Grimoldby, the first station out of Louth which was also still under construction at this time. A second Act was obtained on 17th May, 1877 to allow for a deviation in the route and additional time to complete the single track line. The Louth & East Coast Railway opened on 16th October 1877 with intermediate stations at Grimoldby, Saltfleetby and Theddlethorpe. As well as holiday traffic to Mablethorpe, the line passed through rich grazing land which would also bring additional income to the line with livestock being carried from all stations to Louth Cattle Market. Under the 1884 Harbour & Dock Act, the Sutton and Willoughby Railway Company was formed to build a line from the new Sutton Docks to Willoughby on the East Lincolnshire line in order to distribute locally caught fish to markets around the country. Shortly before the Bill went before parliament a 2ft 6in. gauge steam operated tramway opened between Alford and Sutton on 5th April 1884. This tramway was initially very popular but public support turned towards the proposed railway and the Sutton & Willoughby had little trouble getting their Bill through Parliament on 28th July 1884 despite opposition from the tramway. Contractor James Dickson started work at Willoughby in June 1885 and with a flat route and few bridges progress was rapid with the 7 mile 13 chain line being completed in little more than a year. The GNR refused to work the line until the Sutton Dicks were built but the Sutton & Willoughby argued that they couldn't build the docks without the railway. The GNR eventually agreed to work the line for 21 years in return for 50% of the receipts. The line was formally opened on 23rd September 1886 with general traffic starting on 4th October with five daily trains. One intermediate station was provided at Mumby Road, another proposed station at Huttoft was never built. On the 25th September an Act authorised the Sutton and Willoughby Railway to extend their line to join the L & ECR at Mablethorpe; despite objections from the tramway the Bill was passed. The 2 mile 47 chain extension took three months to complete, opening on the 14th July 1888. The opening of the loop line meant the end of the line for the tramway which closed in 1889 following a dramatic fall in passenger revenue. the money ran out ant it got no further. The LD & ECR had planned to take over both the L & ECR and the S & WR but the scheme was scrapped when the Sutton & Willoughby was unable to repay its debts to the Great Northern. Both lines eventually became part of the GNR, the S & WR in 1902 and the L & ECR in 1908. 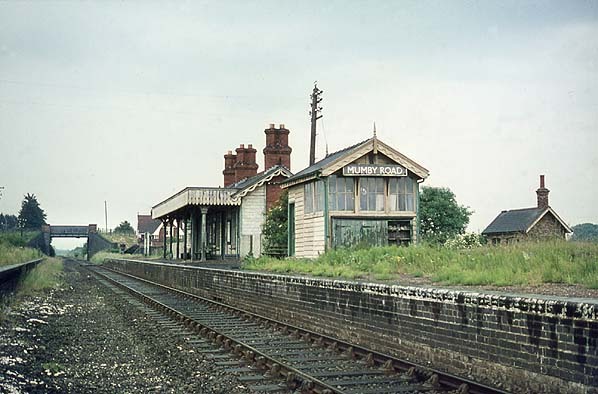 Mablethorpe and Louth which was losing £9,500 a year, passenger and freight traffic was in decline and urgent repairs were required to Mablethorpe Junction at Louth. In October 1960 British Railways announced its intention to close the line. As most of the holiday traffic to Mablethorpe and Sutton came via Willoughby closure of the Louth line would have little effect on this. The British Transport Commission stated that the Willoughby - Mablethorpe line would remain open with services developed if demand increased. The closure of the Louth line would allow improved stabling facilities to be provided at Mablethorpe which would make possible an increased number of excursion trains via Willoughby. With little opposition the line closed from 5th December 1960 with the last train running two days earlier. The track was lifted in February 1963. Despite assurances that the Willoughby - Mablethorpe line would remain open there were local concerns especially from the Mablethorpe & Sutton Urban District Council that within a few years that line two would be earmarked for closure. With the publication of the Beeching report the Council’s concerns were turned into reality in just four years. There had been no attempt to carry out the earlier plans “to develop holiday traffic to Mablethorpe and Sutton.” Instead there had been a deliberate “run down” of railway services with a reduction of cheap tickets and the withdrawal of services from time-tables. By the time the public hearing took place BR were able to claim fewer passengers were likely to suffer hardship because people had been deterred from using the services by the reductions. The Beeching Plan proposed the closure of virtually the whole of East Lincolnshire to railway traffic. 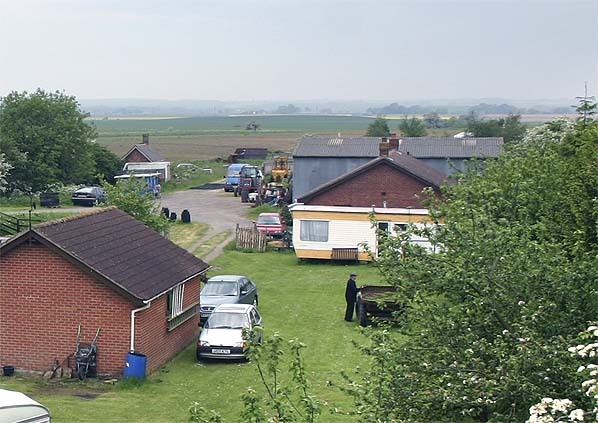 Peterborough – Grimsby via Boston, Lincoln – Firsby via Bardney, Willoughby - Mablethorpe and the Skegness branch. The goods service over the Mablethorpe line was withdrawn from 30th March 1964 and opposition to the proposals to withdraw the passenger services was fierce and prolonged; a public inquiry was held in Skegness on 15th and 16th September 1964, the Mablethorpe and Sutton case being made by the Mablethorpe and Sutton Urban District Council. exception of the Skegness line. 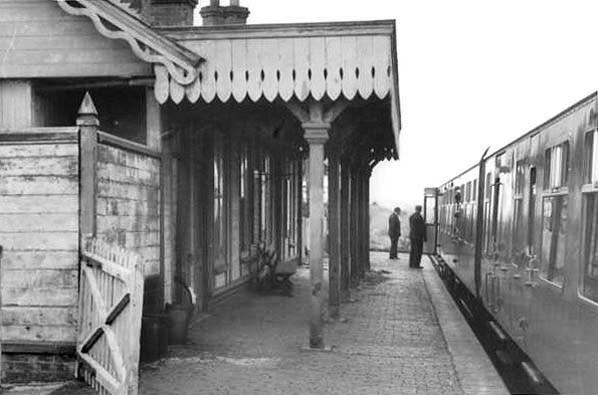 A second TUCC inquiry was held at Skegness in May 1968 and its decisions were again submitted to the Transport Minister who this time supported the Board’s proposals. The Minister was however satisfied that there could be no justification for retaining services between Firsby and Grimsby, he also decided that he should give his consent to the withdrawal of passenger services on the Willoughby - Mablethorpe branch line stating that although closure would affect the holiday industry during its short season there were insufficient regular users of the service during the rest of the year to justify retaining the service. Only the Skegness line would remain open. Closure was announced for 5th October 1970 with the last train running two days earlier. 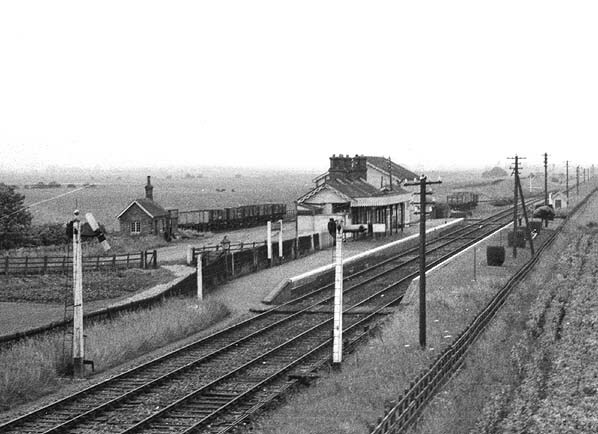 The track between Mablethorpe and Willoughby was lifted in 1971. Because of the flat nature of the landscape little of the line remains today apart from the three substantial station buildings between Mablethorpe and Louth. 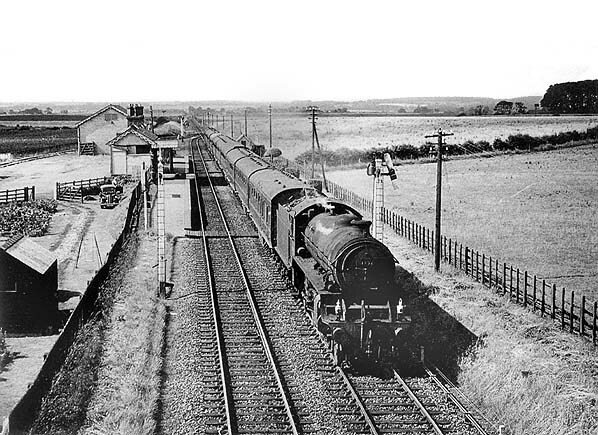 Mumby Road station looking north east in 1958. Note the large timber goods shed behind the platform. Mumby Road station looking south west in 1971, one track has already been lifted. goods shed has been demolished. office can be seen on the left.